Um. I should probably post about my trip—I have some pictures of New Orleans and of College Station, though not many— but this just arrived in the mail. And I think that I am ashamed. It’s like the grad student version of that silver card that the George Clooney character in Up in the Air gets for flying constantly— suitably less impressive. As far as I can tell, this shiny card gives me nothing that my other registered Starbucks card doesn’t. But my other card has birds on it. . .and this one has my name. It’s a sad looking thing, really. It’s very uncool in Madison—and probably in grad school in general— to like Starbucks. But I do. I like the free things that I get with my registered bird card. Sometimes I feel compelled to get free syrups even though I don’t really like them, just because I can. I like that I always know what I’m going to get. I’ve been burned too many times (not literally) by lousy lattes at some of the other coffee shops that are clustered around the university, the employees of which are often more than a little surly. I have my local favorites— places that I’m happy to patronize when I have a long day of work and when I want something better for lunch than the frightening baked goods* that Starbucks seems to truck in from who-knows-where— but for coffee, I almost universally prefer Starbucks. Or Dunkin’ Donuts, but those are sadly lacking in this corner of the world (but not for long, I hear). 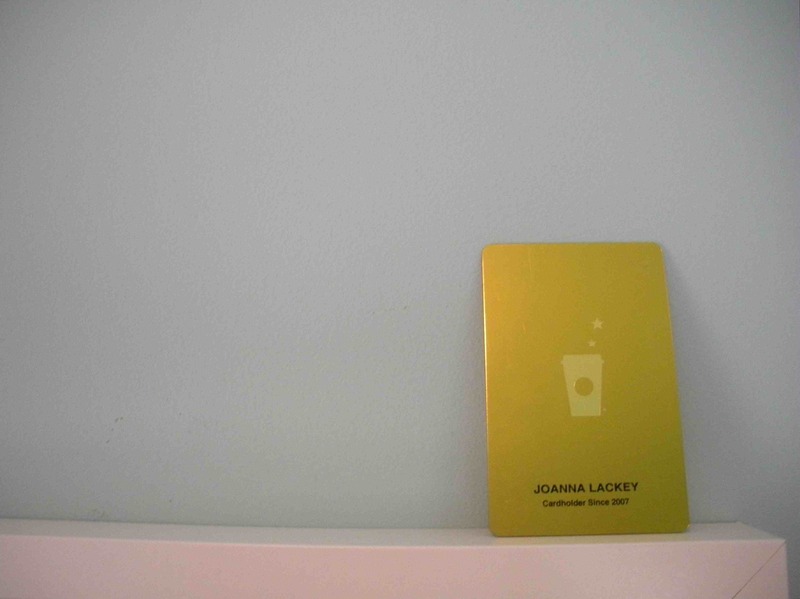 And so I got a lame little gold card in the mail and then blogged some free advertising for the corporate giant. Starbucks, you own my soul— you win. *those tiny sparkle donuts are kind of awesome, though. in moderation. i love starbucks with all my heart. f*** the haters. omg, those sparkle doughnuts. and the mini scones…when they brought those out, i knew i was done-in.